This is the last post in this series of “What we LOVED at the Architectural Digest Design Show 2019!”. Again I have to say I am privileged to live in NY where there is ALWAYS something going on either in NYC or Long Island. The only way you will truly benefit from all the happening is you have to SHOW UP! That really is all it takes! Show up, Learn about the new products, Be exposed to new ideas and most of all Engage with the trades who will become an extension of your business. Remember there is no I in team and wouldn’t you rather have a team behind you than go it alone?? I would!! But that’s just me some people need all the praise and acknowledgment where I’d rather collaborate to take the project to the highest level possible. Back to the post so again if you missed any of the other posts we will provide a link to those before getting into the last one on Furniture and rooms! We may have saved the best for last! You decide! There is so much inspiration to pull from Sasha’s designs! Don’t you think so? CHAI MING STUDIOS showed many beautiful contemporary pieces at the show. Chai Ming Studios was founded in 2011 by visionary designer, Gary Lee. Our values – transcendent design, impeccable craftsmanship, quality service – are manifest in every detail of every piece. Each piece presents a true collaboration between designer, craftsman and client, with an unwavering devotion to materials, process and artistry. We offer refined, bespoke furniture pieces inspired by the international community, extraordinarily executed by hand using traditional methods. We embrace juxtapositions and the unexpected, celebrating textures and finishes while honoring classic designs. We intend this collection as a starting point for designers so that we can work together to create design solutions for any project. We are committed to establishing exchanges that further designers’ visions, extending our approach and sharing our experience. We value relationships, whether with a customer or a supplier in our broad network. We honor the smallest detail and the elegant whole – to us, they are equally essential. KOKET I LOVE this Contemporary Glam vendor! The details in the pieces they have are so original! Daring design aesthetic, high impact events, lavish presentations, notoriously risqué ad campaigns and inspiring editorial, have an uncanny way of conveying KOKET’s mission to inspire love and empower through its statement pieces and unique design driven experiences and content. The innate desire to seduce and entice its devotees is perfectly illustrated in the Guilty Pleasures and Exotic Opulence Collections composed of dramatic case goods, luscious upholstery, exquisite lighting and decadent furs; all of which mesmerize with their magical mineral medleys, lux metallics, vibrant jewel tones and exotic peacock feathers. PASARGAD HOME Another favorite of mine! Love the use of plush fabrics and bold colors in their products. Pasargad’s history dates back to 1904 as designers and makers of some of the finest rugs known for their quality and workmanship. In 1979 the company expanded to the United States and opened a branch in New York City. Founded by Beni Isfahani as a third generation family business entrepreneur. At Pasargad we believe rugs are not just a simple floor covering but a form of art for the floor. We have recently introduced a modern line of home furnishings as well. We’ve always been considered the authority on superior quality, craftsmanship and style. Pasargad’s forward thinking Philosophy has always been to design and create an extensive line of Traditional, Transitional and Contemporary rug and furniture collections to appeal to the latest Industry trend. At Pasargad, we provide our customers with unique products and research of latest fabrics for colors and textures. Pasargad takes pride on providing excellent customer service and remains committed to provide even better services, through its products and ongoing research, so that you as a customer always receive the best possible rug and decor you can imagine. Ngala Trading Co. This vendor was also highlighted in our lighting post. One of the many services we office is Vegan Design which this piece is NOT but for those clients who still prefer a leather piece this one is a Show Stopper for sure!!! Ngala Trading Co. is a luxury home decor brand offering curated, handmade designs featuring exotic, indigenous and sustainably sourced materials from across Africa. 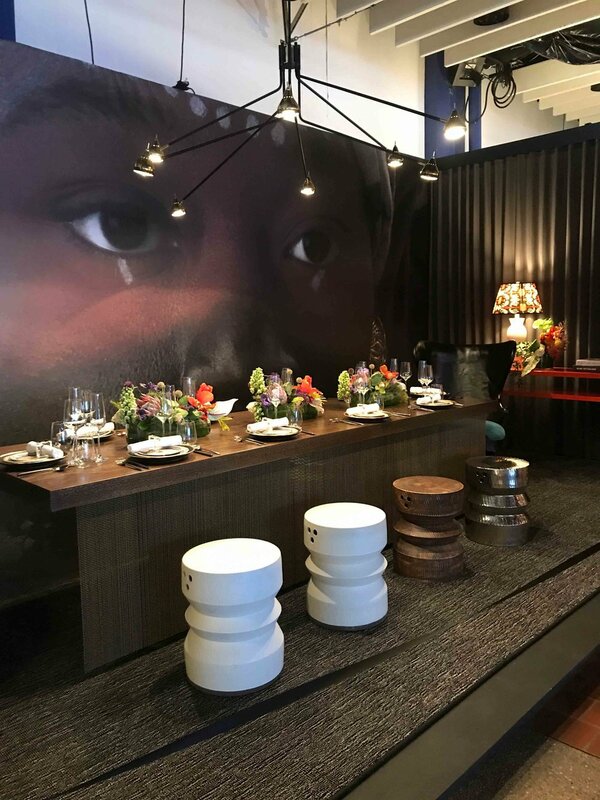 Founded in 2016 by Nick Geimer and Lawson Ricketts, Ngala’s ‘safari chic’ design weaves together European and African design ethos in a sophisticated way. Design headquarters for Ngala Trading Co. is based in New York, New York. COUTURE OUTDOOR This vendor had Super Cool outdoor pieces! COVET HOUSE I receive weekly emails from this vendor and I have to say they are one of the few I actually look forward to and open! Their pieces are just to die for and super Glamtastic!! Covet House is the most powerful tool to enhance creativity among design community. They offered a curated selection of contemporary designs from the world’s top furniture, lighting and accessory brands, together with unique marketing tools, with the clear mission of boosting the creativity of the interior design community. PLEXI CRAFT This was one of my absolute Favorites! I was told with the exception of the crib (for safety reasons) that ANY one of their products can be customized to the exact size you need for your design product. Absolutely love that the possibilities are endless!! Universe please send me a Baby Girls Room to design ASAP!! Fine acrylic custom furniture catering to Architecture and Design (A&D) professionals. Whether you call it Lucite furniture, Plexiglass furniture or Perspex furniture, the common generic name is Acrylic, and it's clearer than glass furniture, half the weight, and up to 17x more shatter resistant! 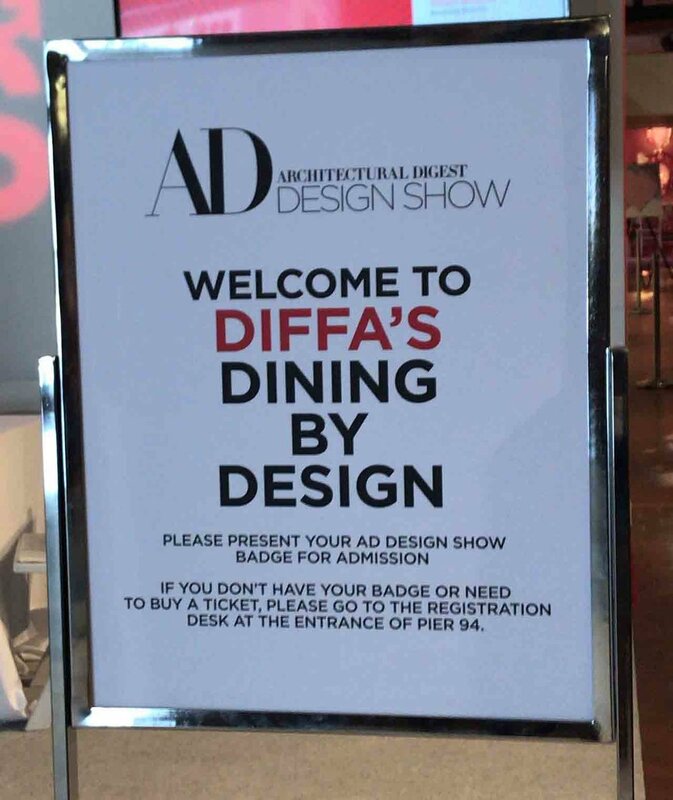 Located at Pier 92 for DIFFA’S DINING BY DESIGN New York was showcased at The Architectural Digest Design Show. 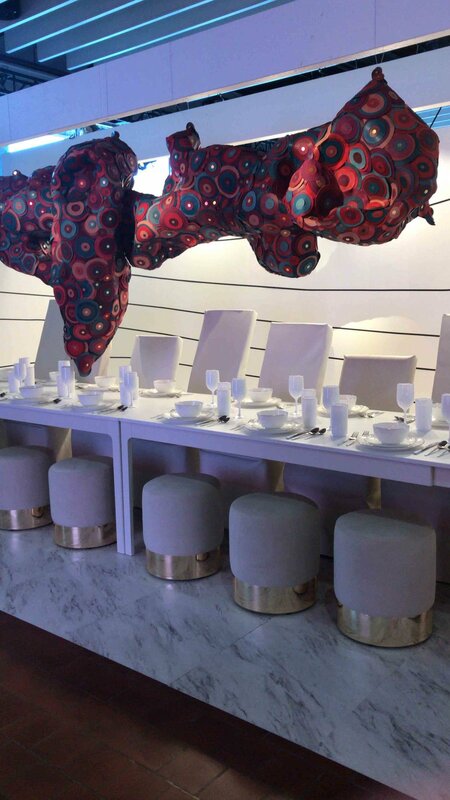 It was home to a spectacular display of cuisine, creativity, and glamour with one-of-a-kind dining environments that awe and inspire—all in support of DIFFA’s work to fight HIV/AIDS. DINING BY DESIGN also featured a dynamic silent auction, the legendary COCKTAILS BY DESIGN party as well as a closing night Gala. 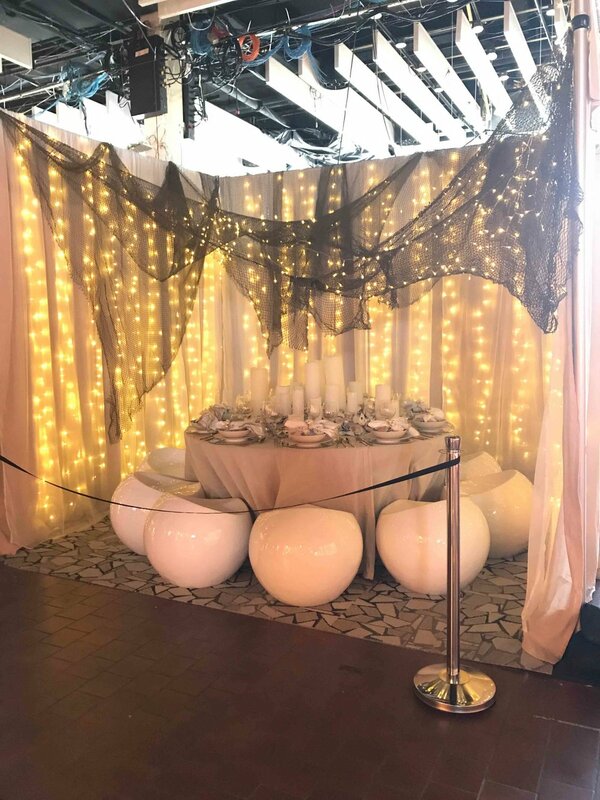 STACY GARCIA was one of the many amazing designers with a table at DIFFA’S DINING BY DESIGN. I truly admire her work so I especially went to see her table which was beautiful and did not disappoint! Stacy Garcia | New York and Stay by Stacy Garcia. Founded in 2004 and headquartered in New York, the privately held company is led by Founder and Chief Inspiration Officer, Stacy Garcia. Stacy Garcia | New York, and Stay by Stacy Garcia, this internationally renowned designer and forecasting expert has partnered with some of the world’s leading manufacturers to create products that span from floor to ceiling for resorts and homes all over the world. She was voted one of the 10 leading voices in the hospitality industry and honored by ASID for Design Excellence. Her work has been featured in Interior Design, Boutique Design, New York Spaces, LUXE, Rue Daily and Architectural Digest. Stacy has an established reputation as a preeminent forecaster of color and design trends, and is a Chairholder of Color Marketing Group, the premiere international color forecasting association. Stacy is also a dynamic public speaker with experience hosting panels, workshops and keynotes. For more information, download Stacy’s speaking bio here. 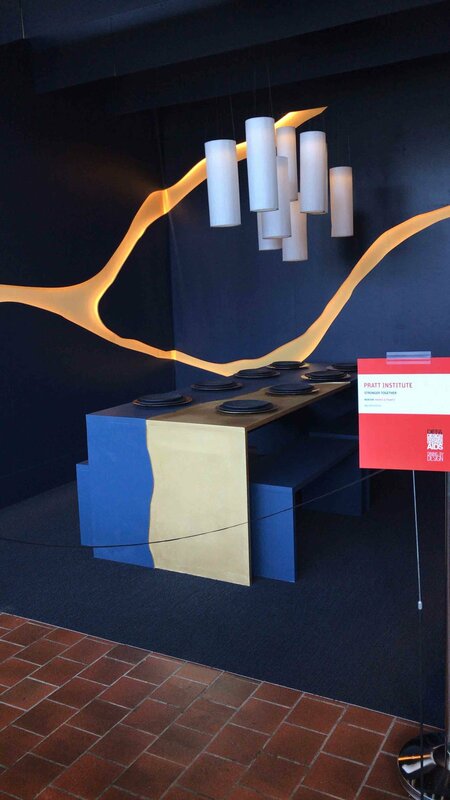 NASURI on display upstairs at the DIFFA’S DINING BY DESIGN. 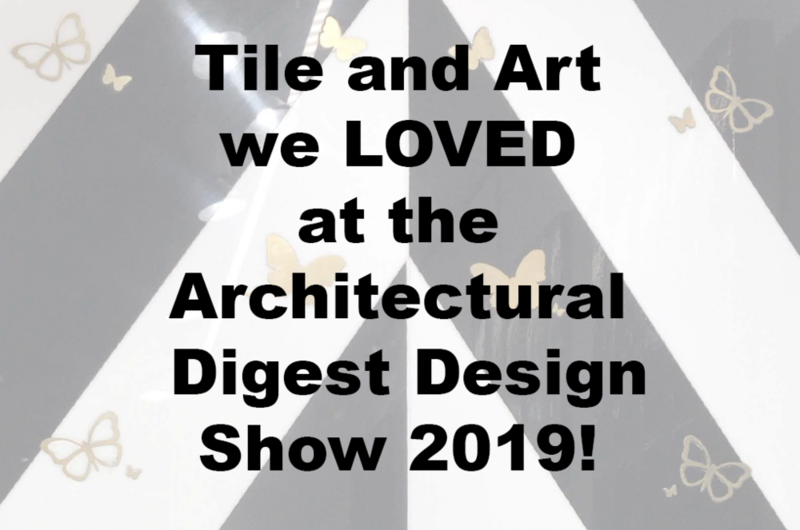 That’s a wrap on this series of Blog Post on the Architectural Digest Design Show 2019! Hope you enjoyed them all and discovered new vendors that could be added to your next design project. Remember DON’T BE ORDINARY! And we are HERE to help you create a space that makes you feel inspired and rejuvenated when you come home from a long day of work! 10 BABY GIRL NURSERY IDEAS!